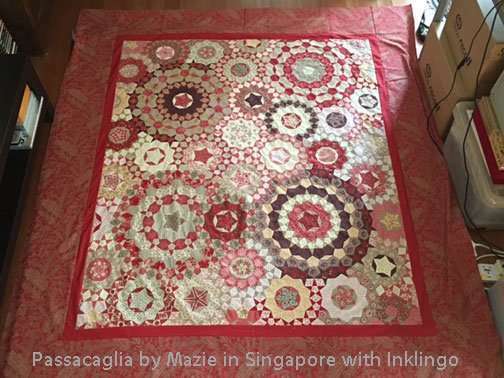 I am delighted to be able to show you Passacaglia and Ballet quilts sewn by three quilters who are loving Inklingo! Mazie chose wonderful colors for her rosettes! This is one of the most elegant interpretations of Passacaglia I have seen so far! 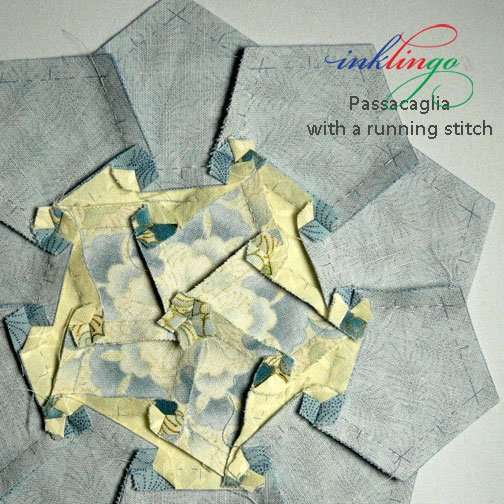 I hear the same thing all the time and it gives me a great feeling to know that Inklingo makes designs like Willyne Hammerstein’s Passacaglia and Ballet possible for more quilters. 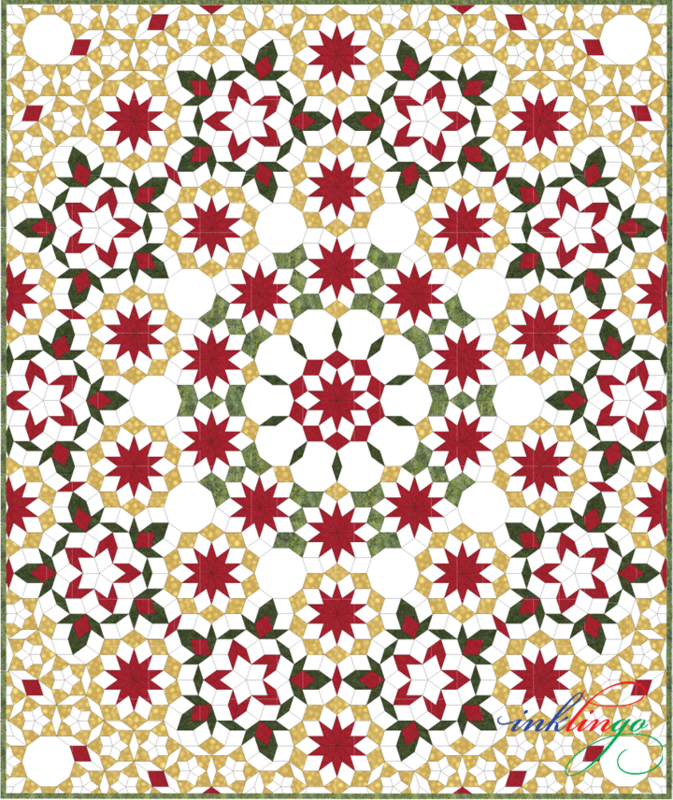 You don’t have to like EPP and you can finish these designs in a reasonable amount of time. 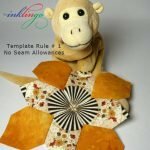 Anything that makes quilting more accessible is a good thing! 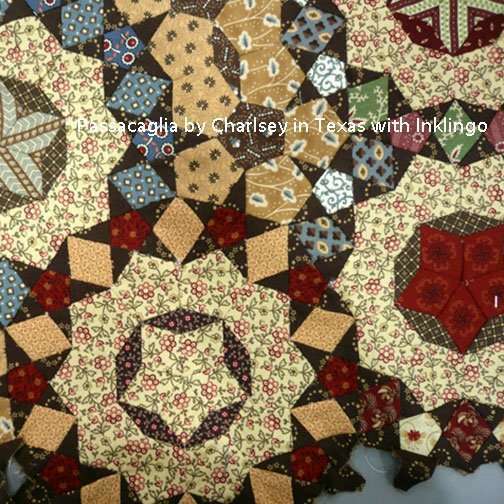 Charlsey in Texas is sewing Passacaglia with a Western color palette—proof that this design looks beautiful with many different fabrics. 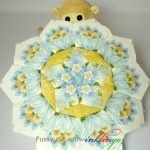 I have featured some of Charlsey’s amazing quilts on the blog before. 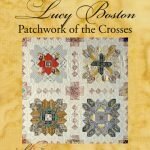 In the past ten years, she has made several exquisite quilts with Inklingo, including her Feathered Star and Fanny Tod’s Sunflowers. You can express your creativity with the fabrics that speak to you. It even looks pretty from the back! It is a big advantage to be able to press the seam allowances to the side, around each intersection. 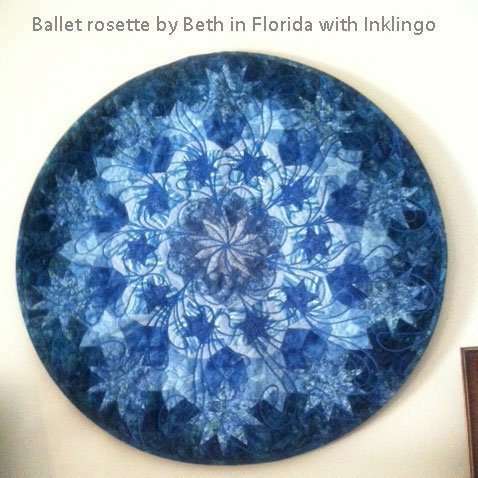 Beth in Florida hand pieced this Ballet rosette (from Millefiori Quilts 2) with a running stitch and machine quilted it. Beth took apart a car windshield sunscreen to get the wire she used in the binding. Very creative! Have you fallen in love with Willyne’s gorgeous designs too? 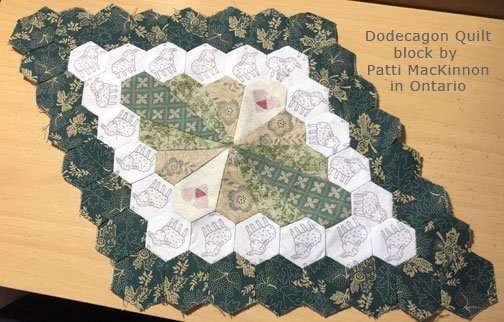 Willyne teaches hand piecing with a running stitch (not English Paper Piecing, as I originally thought) and sewing with a running stitch is even faster and easier if you print the shapes on fabric with Inklingo. 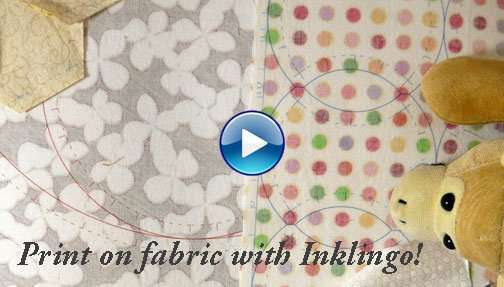 It speeds up the preparation, and printing the cutting and stitching lines on fabric with your Inkjet ensures accuracy. 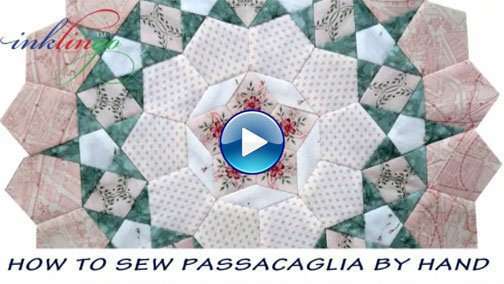 Some quilters are using a slightly larger size to sew Passacaglia and Ballet by machine. 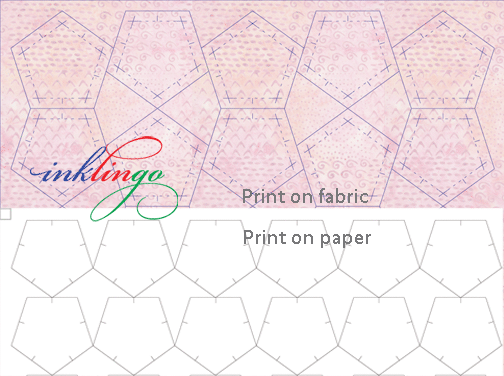 On the other hand, there are 8 Good Ways to use Inklingo if you prefer English Paper Piecing. It was an accident that Inklingo works for EPP too because it is not a method I use. I love hand piecing with a running stitch! If you subscribe to the blog (top of right side-bar), you will always be the first to see what’s new. We love it when you share photos of your Inklingo blocks and quilts on Facebook. 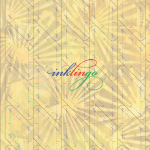 The video Introduction to Inklingo explains the three key ideas that make Inklingo work. I am very grateful to Mazie, Charlsey, and Beth for allowing me to feature their photos online. Do you have photos to inspire us too? Wow too all three quilts. All beautiful and all so different. Wow!! These are amazing. Absolutely stunning. I’m trying not to look too closely. My “want to make” list is way too long as it is. Wish I had discovered Inklingo when I was younger. Too many quilts not enough time. I love the colors in the quilt by Mazie. So many of these quilts have colors from every spectrum, but keeping to colors controlled I think make a lovelier quilt. Thank you, Ingrid. I would love to see photos when you get started too! I ordered my kit last year but haven’t begun yet as I’ve got so many UFOs that I need to complete at least two before beginning another project. That said…I am impressed with these quilts and the ideas of fabric usage are floating around my head – I try to pull from my stash, but who can resist the scrumptious new fabric lines each season? I’ve begun to collect my fabrics and store them in a separate project container. Please keep showing/sharing these inspirational quilts.